It had been talked about for months, and now the day was here. I found myself in a rented cargo van, with only 3 hours of sleep, at 4:15AM, headed off to the Rochester, NY hamfest. A Collins KW-1, URT-368 transmitter and a heavy-duty generator strapped securely in the rear. Let me backtrack. Last August, Tom W2KBW and I had been discussing the merits of running an AM Special Event Station at the Greater Buffalo, NY Hamfest. Consisting of my trusty T-368/R390A combo, it was a smashing success, and stirred a great deal of local interest in AM and vintage gear in general. It was only natural for Tom and I to decide to see if we could make lighting strike twice. 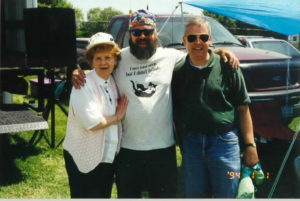 So we planned to offer the same station line-up at one of the largest hamfests in the Northeast, Rochester, NY held June 4-6. It was not all that easy however. An early call placed to the hamfest director offered us free space, but inside the Dome. For those who have never attended Rochester, the Dome stadium is a rather imposing structure of steel and concrete, not something that radiates RF very well. Thanks to the efforts of Paul WB3VJB, this matter was dealt with, and we were cleared, and even encouraged to operate outside. AM Special Event – Rochester Hamfest. 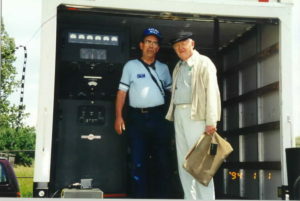 Bill K2LNU and Bob W8MNQ with the Collins KW-1 and mobile station. Our plan had called for using the T-368 and R390A in the back of a rented cargo van, for shelter and ease of setup. The T-3 would have been fun, but unbeknownst to me, something bigger and better was an about to happen. The weekend before the hamfest, I was in Syracuse visiting with Tim WA1HLR while he converted a 50KW transmitter for use on the shortwave bands. Tim skills had been hard at work bringing a Collins KW-1 back to life for an owner in New England. I had often admired the transmitter on previous visits. This time however, I did more than admire. The devious gears clicked and whirled in my brain, and before I could think about it I found myself asking “Hey Tim, what about bringing the KW-1 out to Rochester?” Before Tim could say “No”, I was offering a solution to every possible rejection, “Yes, I would pick the receiver up at the shop”, “The hamfest would provide a great sales venue”, “It would be safe and secure in the van”, and yes, a free dinner would be proffered! And now, here I was, with both the T-3 and the KW-1 on my way to the hamfest. Tim had done a remarkable job of “strapping down” the unit to operate on the weak 120 volt service the site offered. RF output was a fraction of the true power of the beast, at 250 watts. Tim’s magic worked well, and those 250 watts were more than enough to be heard throughout the east cost, and into the Midwest. Station operation commenced at 10:00AM Friday June 4. The layout consisted of a KW-1, a R390A receiver, RCA BC-7 Broadcast Board, Symetrix 528e Voice Processor. The antenna was an 80-meter dipole feed with balanced line. I had brought the URT-368 along as a backup transmitter, but it was unneeded. The KW-1 functioned flawlessly throughout the two-day event; in fact the entire station suffered no problems whatsoever! (Not bad considering it was operated near non-stop 10 hours a day in 80+ degree heat!) The only problem we did experience was RF getting back into the audio when we first used the RCA board. Tim quickly cured this by grounding the truck, turning the entire structure into a Faraday shield! We had a great site, not the one that I had originally picked, but in retrospect it was actually better. The station was located on what came to be called the “grassy knoll” directly in front of the Dome building. Aside from having a higher elevation that the proposed site, two power poles and a tree provided ideal antenna supports. The AMI (Amplitude Modulation Incorporated) banner was attached to the antenna, and fluttered high above the station, visible through the fest. The station was graced with some special visitors’ early Saturday afternoon; Kay Cragie and Bernie Fuller, Atlantic division directors from the ARRL stopped by for a photo op. Of course the AWA contingent was present as well, Bob W2ZM, Mike W2ZE, and Manny stopped by and joined in the festivities. We did not have a sign in log, but I would estimate that well over 250 people stopped by to check out the station, and perhaps 50 or so of those were actually drafted to become operators. The station crew was very friendly, inviting anyone into the van to view the layout. We were even able to persuade a couple of fellow hams XYLs to grace the airwaves. Watching passersby over the two day event, I would see them walk by, do a double take at the sight of the KW-1 on the rear of the truck. Then their face would break out with a large smile, and they would walk up to the station. Tom W2KBW had provided a large monitor speaker, and those gathered outside could hear the melodious tones of AM quite clearly. It was a common sight to see 15-20 people huddled around the station speaker, listing to those on the air holding forth. It was especially interesting to hear the stories from the old timers who had owned or operated a KW-1 at sometime in the past. I simply could not think of a more pleasant way to spend a weekend. Although the event was most enjoyable, we had another agenda to fulfill that of promoting AM to the “great unwashed”. So often we hear comments that AM equates to Ancient Modulation, wastes band space, is technologically backward, offensive and even boring. We know that nothing could be further from the truth! Not one person that stopped by had anyone but praise for the operation, and for AM. Indeed, I heard more than one ham mention that he planned to dust off his old gear on join us on the air! And those simple words made the entire effort worthwhile. We broke camp about 5:30PM on Saturday, having filled near 4 pages in the log with AM contacts, making many new friends, and enjoying old ones. More information, along with copies of the log, audio clips and photos are available at the Buffalo AM website, http://hamgate1.sunyerie.edu/~buffaloam. Many thanks to those who helped throughout the event, Tim WA1HLR, Tom W2KBW, Bill K2LNU, “Marathon Man’ Russ WB3FAU, and the numerous operators who provided some of the most enjoyable QSOs of my amateur experience.